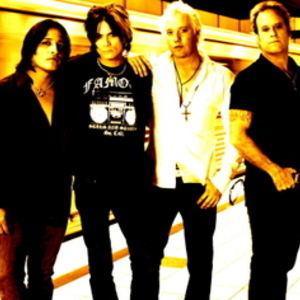 The SAINTS OF THE UNDERGROUND formed in 2006 with Bobby Blotzer (Drums) and Keri Kelli (Lead Guitar) recruiting Jani Lane (Vocals) and Robbie Crane (Bass Guitar) to fill out the roster. Separately, these musicians have achieved multi-platinum success Hooks, big guitars, and rock-n-roll attitude are the driving force behind the music they perform together. Although SOTU started out as four guys playing cover tunes and having a good time, the chemistry grew between them. The band naturally evolved into a creative partnership and new songs emerged. Although SOTU started out as four guys playing cover tunes and having a good time, the chemistry grew between them. The band naturally evolved into a creative partnership and new songs emerged. The band entered into Blotzer's Studio (for drums & bass), diamondrecordingstudio.com, and Kelli's studio (for guitar & vocals) capturing an array of original material. The result is their debut CD Love the Sin, Hate the Sinner, written and produced by Jani, Bobby, and Keri; mixed by legendary Producer/Engineer, Andy Johns, who has worked with greats such as the Rolling Stones and Led Zeppelin.